Like all contemporary classical composers working today, John Adams firmly believes that American opera is innovating away from establishment opera and desires to be an agent for that process. In an interview conducted nine years after the premiere of Nixon in China, Adams’ first opera and arguably his most influential, he predicted his colleagues would not be “drawn to the conventional operatic format, with a symphony orchestra in the pit and unamplified voices onstage; I am sure that music theater is in a somewhat reactionary phase right now.” In particular, future operatic works will experiment, “in terms of mixing media and really extending boundaries […] or something far more influenced by music theater from other cultures.” Not surprisingly, The Death of Klinghoffer makes good on each of Adams’ predictions. In still another interview, Adams cites Syrian music among his models for this opera’s score. His familiar favor for synthesizers displays itself in the orchestral scheme, but he takes it to a different level in the second act when electronic sound nearly replaces the violin section as the opera’s main musical vehicle. For a musical family in which contemporary classical music is still the black sheep, however, such innovation, if done without palpable musical or dramatic achievement, will not change any hard-hearted, classicist opinions. What Adams needs to do is convince us that his contribution to the body of operatic works is not merely “reactionary”—modernism that does not understand how anybody can be opposed to change. To be sure, he has expressed grand intentions that excite the most die-hard traditionalists—expression, freedom from the constraints of both minimalism and goal-oriented melodies that characterized nineteenth century opera, faithfulness to normal speech patterns rather than the foreign poetry that usually comprises libretti, inclusion of non-Western music, a modern link to the roots of opera. The Death of Klinghoffer is at once frustrating, tiring, and heartbreaking in that it clearly shares each of these objectives but is unable to fulfill them. Indeed, its example functions well as a case study for how contemporary classical composers can refine their line of musical development. The Death of Klinghoffer chronicles the hijacking of the Italian cruise liner Achille Lauro by four Palestinian gunmen seeking the release of their compatriots from Israeli prisons. The hijacking lasted from October 7-9, 1985, and claimed the life of wheelchair-bound American Leon Klinghoffer, who was on vacation with his wife Marilyn. While it shares with Nixon in China a plot based on actual historical events, Klinghoffer is as abstract and conceptual as its predecessor was documentary. For fear of redundancy, Director Peter Sellars expressly intended that the opera not rehash the hijacking in a dramatic setting. The original production thus featured an amorphous and versatile set by George Tsypin and unremarkable, almost interchangeable, costumes by Dunya Ramicova. Singers double in different roles and many of the principals had dancer-doubles in a manner reminiscent of Bertolt Brecht’s Seven Deadly Sins. An interlock of flashbacks and action based in the present time form the linear narrative of what transpired during the days of the hijacking. By freeing Klinghoffer from the traditional stage trappings, Sellars positioned the production to achieve Adams’ main theatrical objective: to exhibit and explore the minds of his characters. Recitatives are only as long as is necessary to build a narrative bridge between musical numbers, and arias are near-indulgent in the detail of thought and emotion they reveal. In the grand tradition of the Bach Passions and Greek tragedy, and the newer influences of Persian Ta’ziych and Javanese Wayang Wong, all of which Adams cites as models, the opera is subdivided into the chorus’ storytelling and the actual words of the drama’s participants. The chorus is the master of this opera, providing the religious context of the millennia-long struggle between the Jewish and Islamic faiths and the socio-political context of the conflict between Israelis and Palestinians as both components and instigators of the drama unfolding onstage. Though Adams likes to emphasize the religious nature of his dramatic models, the choruses do much more than establish the religious foundations of this story. 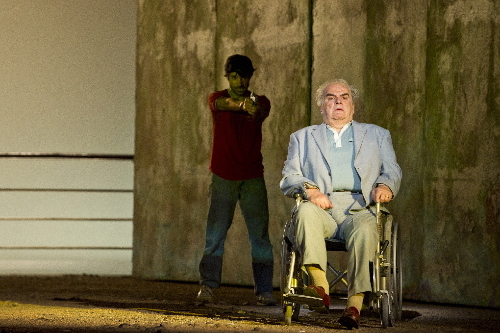 Indeed, if a primary artistic motivation can be discerned from Klinghoffer’sstaging, it is that Adams has attempted to do nothing less than write an opera in which the ideas that underlie the action are themselves the main characters. To evoke the emotional heft and psychological nuance of grand conflict as they are, with minimal dramatic conduits—a winning and thoroughly modern platform, but Adams must do more than introduce new theatrical vehicles to succeed. He must also remember that after stripping down and recasting the elements of traditional opera, he still has to contend with music and the words set to it. Which means, there are still rules that can be followed or changed, but not broken. The first rule from which Klinghoffer meets resistance is not so much a rule as it is a fact—if music desires to communicate something, it must create a sound for it. For his score, Adams draws from an effective, if not all too familiar, catalogue of modern sounds. Tranquility has been assigned the string section sustaining a single note or alternating slowly between two notes for an entire musical number. To create tension, these strings tremble between two chords of a dissonant interval. High anxiety is this same sound at forte. And relentless turmoil is the same sound still, but fortissimo. Of course, this being an Adams composition, the strings are not the only, and often not even the main, source of music. Lone flutes, bassoons, and oboes not only function as the opera’s main obbligati, they also illustrate a technical proficiency at counterpoint that happily connects Klinghoffer and Bach beyond the narrative structure. That Klinghoffer’s use of the synthesizer upholds the weight of the accompaniment on its own and overall seems to be entirely fitting instrumentatation is already a noteworthy innovation in operatic music. Unfortunately, the achievement is somewhat dampened by the fact that we are not entirely sure why the synthesizer plays such a prominent role—while its freshness is undeniable, its interpretive significance is not quite as clear. With regard to the vocal parts, their musical construction could not be simpler—high notes corresponding to high emotion, and notes in the middle range for nearly all other action. This distillation of Klinghoffer’s music seems overly simple and crude, yet little more can be added to complete it. For the score works in chunks: one sound sustained for several moments, replaced by another sound for the next section of bars, and so forth until the last note is sung. Klinghoffer has not concealed the limited toolbox from which it was composed; though always appropriate, it is never pitch perfect. Klinghoffer’s narrative structure was chosen specifically to make this opera a searching exploration of individual minds and lofty ideas. As any good modernist would, Adams understands the complexity of both, but the music’s lack of variation suggests otherwise as it constrains and obfuscates much more than it expresses or reveals. Alternating modern string sounds, woodwind counterpoint, synthesizer beats—all saved from the status of stock music only through Adams’ now instinctive rejection of minimalism in the orchestrations—are not enough to capture all the shades and subtleties of the human mind. Klinghoffer simply needs a broader catalogue of musical sounds to work with, and an understanding of how those sounds can be manipulated to seem as though they are a natural fit for the idea they express. The temptation at this point is to blame the stunted development of contemporary classical music, both its stubborn unwillingness to borrow music from its predecessors and its inability to invent the same range of sound on its own. To do so, however, is to ignore the sheer rawness of sound that has come to be contemporary classical opera’s distinct advantage over establishment opera. Though the musical range is limited, the sounds that modern music is capable of consistently evoke a visceral, almost primal response; before we heard them, we had never been provoked to leave opera’s traditional escapist and controlled environment. In another era, Adams’ opera of ideas would have been an intellectual laughingstock and musically impossible. To a dissatisfying extent, we still do not fully understand how to best execute it, but we have at least accepted it as an admirable objective. Fortunately, since Klinghoffer is an opera, there is no need for the score to work alone. Sadly, its libretto, written by poet Alice Goodman, is pulled along to the same fate—very clearly an opera of ideas without actually understanding how opera can be such a thing. Even more so than a unique symphonic sound, the faithfulness to normal speech patterns, replete with correct stressing, syllabic division, and cadence has become the trademark of Adams’ choral and operatic works. Given the stringent minimalist repetition of the melodic line, this is not achieved without some skill. The effect is a cross between singing and speaking that makes all the more believable a core premise of opera—that a character could be so moved that he would burst into song, only instead of the traditional soaring melodies, we have the more realistic speech sung in a legato line, with the melody only a series of tones matching the pitch of the syllable assigned to the note. But this is not music. It is aimless speaking on pitch. At times, the auditory and emotional forcefulness of all other components of Adams’ score renders the singing almost superfluous. Frequently, it is just a matter of the accompaniment being too loud for the singing; whether this is due to lack of projection on the part of the singer or mismatch in dynamics by Adams is ambiguous, but it is safe to assume that no singer could have been expected to sing over a section of strings and woodwinds at fortissimo. Not only is this overshadow distracting, it ultimately makes the singing sound impotent, as if woefully inadequate at expressing all the emotion it desired on its own and needed the help of the accompaniment to do so. When the libretto is most adherent to speech and least musical, Klinghoffer resembles a movie with a soundtrack, which creates the odd impression that either the music is what makes this opera or that it actually is not needed at all. At best, we witness a competition between two elements of an opera that are supposed to be mutually supportive and at most, the orchestra is just as dramatically effective without the libretto at all. What ultimately prevents Klinghoffer from soaring is that the limited range of the orchestral music is nevertheless much more capable of expressive power than minimalist repetition of a tonic melody, upon which all sung lines are based. Adams has forged a musical identity from adding layers of orchestration and instrumentation to basic minimalist patterns with the hope that they become less scientific and more expressive, less constraining and more potent. Despite his efforts, the tempo, accent, and series of tones remain palpably repetitive, as much an anchor to the music as an awkward weight. Add to this constraint the fact that speech must be mimicked closely and the general sound of words preserved, and the result is two alternating situations: the speech is ridiculously over-dramatized and would have worked better as a recitative; or, the line is hopelessly repressed as we hear the words and understand form the swell of instruments the significance of the moment, but the score’s adherence to the same melodic line leaves us bereft. Minimalism’s heel is felt throughout the opera as a whole, but nowhere is it more harmful than in the second act as Leon Klinghoffer and Rambo, the most gratuitously violent highjacker, confront one another just before the former is killed. Everything is in place to establish this scene as the opera’s climax—passionate performances by the singers, the words of condemnation and hate, the turbulent accompaniment, and the knowledge that the murder will happen imminently. But the melodic pattern, the infuriating cycle of notes, forcibly restrains the potentially explosive emotion of these successive arias. If the minimalist scheme had been disobeyed here, there (maybe everywhere), the magnificent power that is opera’s trademark could have been released. At the close of the number, we feel sheer frustration. It is a shame that this is the case, for the libretto is quite a solid and excellent work of modern poetry in its own right. Recitatives are straightforward accounts of events that serve primarily to move the opera forward, but they are by no means dull or uninspired. Indeed, Goodman has a keen ability to weave together narration and metaphor coherently and seamlessly, as if their presence in the same train of thought were expected and natural. The Captain sets the tone of Klinghoffer with: “It was just after one-fifteen / I was awake / but lying down / as I had spent a sleepless night / before we docked / that morning. Thought / the sailor’s consolation is surely the night’s analysis of the impression of the day.” The Swiss Grandmother sings, “To see one’s fellow men / become like beasts / diminished by each scream / that, for me, is what / shocks. How thin the coat is: / unlined velveteen, and underneath / the monkey’s back.” The opera is a series of such internal monologues, plainly presented or disguised as dialogue between characters, each with the right balance of mundane observation and eloquent abstraction, and yet the narrative moves forward in a linear manner. This is not Goodman’s only feat of illusion, as she fully utilizes the gravity of the opera’s events to ensure that the reflection of the characters does not appear out of place. Her libretto would have made an excellent play, just as Adams score has all the characteristics of a prodigious soundtrack; unfortunately, the two fused together do not magically become an opera. It is beginning to seem as though Adams’ vision for Klinghoffer and contemporary opera is impossible; it forces together operatic elements desirable on their own but incompatible with one another. What ultimately redeems this opera’s artistic worth is that its formula does at times achieve its intended purpose given a few negligible compromises and the right context. Adams has suggested that of all his characters, Mamoud was the most interesting to write because, of all the highjackers, he is the most immune to oversimplification. He is not instinctively violent, nor as single-mindedly devoted to their mission as their leader Molqi, and he does not crave martyrdom as Omar does though he is perfectly willing to die for his cause. While guarding the Captain, he shares his love of Lebanese pop music, particularly the melancholy love ballads, the story of his brother’s gruesome death, and an adamant unwillingness to open a dialogue with the Israelis. The Captain, touched by what he hears, tells Mamoud that if his people could only speak as he had just spoken, then peace would be possible. At the risk of sounding melodramatic, if every character had been written and scored as Mamoud was, Klinghoffer would have become what Adams imagined he was creating. His melodic lines are still minimalist, but they have been slightly liberalized such that they use rather than enslave themselves to normal speech patterns—words are still recognizable and the pitches of the syllables in relation to one another are preserved, but cadence is almost altogether ignored. In keeping with the lyrical nature of Mamoud’s arias, the tempo of the melodic line is slowed such that each note has the time it needs to luxuriate in its emotion. The result is a synergy between music and verse that at once elevates the speech into operatic poetry without shattering the illusion that Mamoud must rely on both song and spoken word because the latter alone is inadequate. The accompaniment supports the singing perfectly as it stays at piano on one note, neither distracting in its presence nor irrelevant. It is the choruses, however, that will become the chestnuts from this opera. The layering of the voices to create texture, the expertly assembled harmonies, the unparalleled poetry of the verse, and the stubborn refusal to be overwhelmed by the orchestra indicate that Adams does have a deep understanding of how to unleash power on an operatic scale through meticulous coordination of musical elements. As a testament to their quality, the choruses will certainly be studied and appreciated as a significant achievement of contemporary classical music, but their dramatic inventiveness will be even more influential. Adams does not make the mistake of imitating the Bach Passions and Greek tragedy without also ensuring that some of the magic it was able to create in those works did not also appear in Klinghoffer. Though not a participant in the opera’s events, the chorus is more important than any individual character, and arguably the entire cast as a whole, in its role as a commentator. It announces itself in the prologue as the Exiled Palestinians, forced to evacuate to make way for the new Israeli state and all but swearing revenge. The Exiled Jews immediately respond with a love song to their ever-distant promised land. During the first night of the highjacking, the Night Chorus takes on the guise of a predator, hunting and drawing forth desperate screams of, “Elijah will return, the Jews believe.” The Chorus of Hagar and the Angel tells the story of Hagar, Abraham’s Egyptian slave who bore him a child Ishmael, but was banished when Abraham’s wife Sarah gave birth to Isaac. As Hagar and Ishmael wandered the desert without water, an angel miraculously reveals to them a well. It is the rivalry between Ishmael, whom the Muslims venerate as an ancestor of Mohammed, and Isaac that begins the religious conflict between the Jews and Muslims, and by extension, the Israelis and Palestinians. Even more so than the internal monologue of the characters, the choruses establish that this opera is not a documentary retelling of the Achille Lauro highjacking. It is a drama of religious and socio-political conflict that manifests itself in episodes such as the one we see played out before us, but whose existence is much more expansive and uncontainable precisely because it is a war of ideas that have only managed to take firmer hold over multiple millennia. One gets the foreboding sense that the next episode will also be commentated by this chorus, and their song will be unchanged. It is impossible to discuss Klinghoffer without mentioning that theopera will probably never again be performed in the United States. When it premiered at the San Francisco Opera in 1992, it was picketed by the Jewish Information League, who perceived it as anti-Semitic. Its sternest criticism came a few months after the attacks of September 11, 2001, when prominent musicologist Richard Taruskin urged, “If terrorism is to be defeated, world public opinion has to be turned decisively against it […] no longer romanticizing terrorists as Robin Hoods and no longer idealizing their deeds as rough poetic justice.” Though Taruskin’s statement is justified, there is no evidence that Adams would disagree with any part of it. The opera depicts both Leon Klinghoffer being shot at point-blank and the glee of the terrorists at the fear of the hostages. At worst, Klinghoffer refuses to categorically demonize the highjackers, giving their rationale for violence not insignificant airtime. It is a pity that its controversial subject has drowned out discussion of its importance as a contemporary opera. Adams may not have actually achieved all that he wanted to artistically, but we should not forget through the haze of criticism, whatever its subject, that we want him to succeed. Klinghoffer, like its fellow Adams compositions, has given the traditionalists a reason to believe in modern music by assuring them that what they want to see in music has not been lost in the tide of reactionary works. Given a stage, Klinghoffer can even perhaps aid contemporary opera in its as yet incomplete quest to define and realize its place in the operatic world. You are currently reading The Death of Klinghoffer at The Aleph Mag.